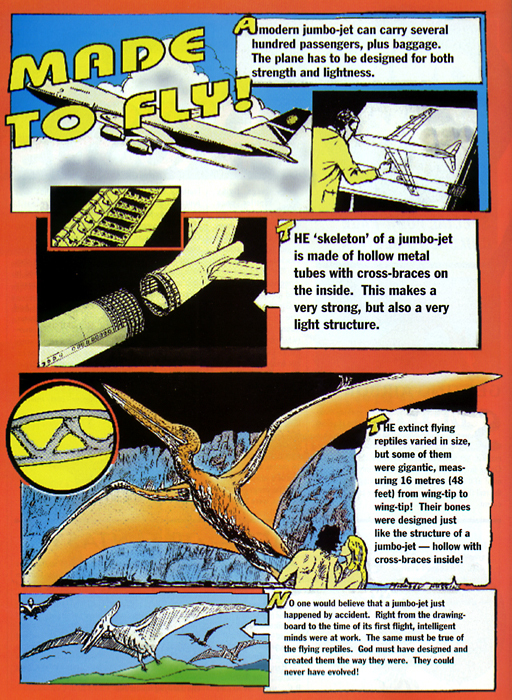 Several people have tried to make working models of flying reptiles. In England, a man designed a radio–controlled pterodactyl with a five–metre wingspan. He took eight years to make it. Yet, when he launched it off a cliff at Cheddar Gorge in Somerset, it crashed after only a few minutes! If it’s so difficult to make a working model, then the real flying reptiles could never have evolved by accident. Strange flying reptiles once soared in the sky. Did these ‘flying dragons’ evolve from reptiles which crawled on the ground? The first fossil of a flying reptile was discovered in the 18th century in Germany, and was the size of a bat. It was named pterodactylus (which comes from Greek words meaning ‘wing finger’). Later, larger fossils were found of creatures that measured about five metres from wing–tip to wing–tip. These were named pteranodon (meaning ‘winged, toothless’). Since then, even larger ones have been found, measuring about 16 metres across—the size of a small jet plane! The wings of flying reptiles were made of leathery skin, and the fourth finger of their claw ran the whole length of the wing to support it. Could these flying reptiles have evolved their wings? People who believe in evolution say that their ancestors were reptiles which lived on the ground, and that gradually, over millions of years, their front legs became wings, and they were able to soar in the sky like birds. If this was true, we would expect to find fossils of reptiles with partly–evolved wings. But no one has ever found such a fossil. When we look at the wonderful way that the flying reptiles were designed for flight, the best explanation is that they were created by God in the beginning already able to fly. Pterodactyls had teeth; light, hollow bones; and had a fur–like covering. Their leathery wings were supported by an extra long fourth finger. Evolutionists cannot explain where these “flying dragons’ came from. Surely no one believes in flying dragons? Aren’t they only a legend? Well, the pictures of flying dragons may be a bit fanciful, but could they be based on fact—a memory of a time when people actually saw flying reptiles? Herodotus, a Greek historian, in the 5th century BC, wrote about the ‘winged serpents’ of Arabia, which seem to have been very much like pterodactyls. Similar creatures were also seen in Ethiopia and India, and people now living in the jungles of southern Africa say they have seen flying reptiles—they call them ‘kongamato’. The evolution theory says that flying reptiles died out about 65 million years ago, but this idea seems to be mistaken. 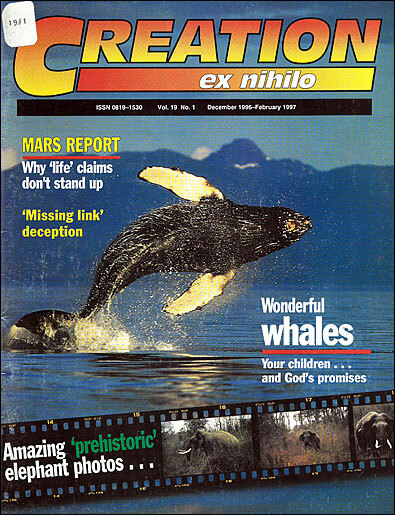 There is good evidence that humans have seen flying reptiles, and there may even be some of them alive today! The Bible says that God created ‘winged creatures’ on the fifth day of creation. This would have included flying reptiles. In the last issue of Our World, we invited readers to send us their ideas about ‘God’s Firsts’. So far only one of you has responded — Ervina Kongoli who lives in Albania! She wrote: ‘Thank you very much for the Our World you have sent to me. It is a very interesting paper which I read with great pleasure. It has helped me a lot to improve my English. Some of my friends like it very much too, so I give it to them, and we discuss what we read in it.’ Here—with a few small alterations—is Ervina’s article. These are my ideas about ‘God’s Firsts’. I think that people have been copying things God has done from the beginning of the creation. The paper I write on is an imitation of that produced by wasps and hornets. There are about 500 kinds of fish which are provided with ‘batteries’ which produce electricity. One example is the catfish of Africa, which can produce enough voltage to stun a man. We cultivate the ground and keep animals; some kinds of ants—the leaf–cutters—work as gardeners. They cultivate fungi for food in a mixture of leaves and their own organic waste. Other ants keep plant–lice (aphids) from which they ‘milk’ a sweet secretion. The ants even build ‘stables’ for them. Migratory birds have a kind of magnetic compass in their heads. Dolphins use sonar—and so do bats, seals, and some birds which nest in dark caves. Submarines sink and turn by changing the ratio between water and air. This is done by a lot of sea–animals; for example, some fishes, sea–snails, sepia, etc. The pores in the bones of sepia work just like the water–cylinders of a submarine. We know that human divers breathe from air cylinders, but water beetles and water spiders catch air bubbles and dive under the water. Air conditioning in houses is quite modern, but termites have used this technology in their buildings since their creation. Humans make anti–freeze from glycol (for example, in car engines), but some microscopic plants in arctic lakes use glycerine, which is like glycol, and some can survive at temperatures of –20 degrees Celsius. There are some fishes which have their own anti–freeze, and can survive in the freezing waters of Antarctica. Some trees can withstand temperatures of –40 degrees Celsius because they contain ‘very clean’ water, without specks of dust or other impurities on which ice crystals could form. The technology of an incubator is used by sea–turtles and some birds, which lay their eggs in the warm sand, and some birds put their eggs in the warm ashes of volcanoes. Some alligators cover their eggs with rotting plant material which gives off heat. The Australian Mallee Fowl does this perfectly, and keeps its incubator at a temperature of 34 degrees Celsius by adding or taking away sand from its eggs, which are placed in a hole specially dug for that purpose. The Mallee Fowl, like a similar bird—the Australian Brush Turkey—uses its beak as a very sensitive thermometer. Some rattle–snakes have sensors in their heads which allow them to notice a temperature change of one five hundredth of a degree Celsius! Humans build water purification factories to take the salt out of sea–water. Some trees do this through their roots, which filter out the salt by means of special membranes. A lot of sea–birds drink sea–water, and are able to eliminate the salt from their blood. So do penguins, sea–turtles and some other sea–animals. The name of a bird is hidden in each of the sentences below. See if you can find them (answers follow immediately—don’t peek). He was almost rich enough to be a king. How long must we go on waiting? I saw your pet relaxing on the carpet. Your new rent payment is due. I see a glen in the distance. The boys want to go home now. They were both rushing to school. It was her only mistake that day. Many birds have beautifully coloured feathers, but the peacock is one of the most spectacular. When it opens its fan–like tail, the patterns on its feathers are like eyes. A close look at each pattern shows that each tiny part of the feathers is designed to make up this unusual pattern. How did the peacock get its wonderful display? Evolutionists say it evolved its exotic tail because it would be easier to attract a mate, and this would help peafowl to survive. If this were true, though, we would have to ask how lots of other birds have managed to survive without pretty colours. Could the peacock’s tail really have evolved gradually over thousands or millions of years? Even Charles Darwin, who made the evolution theory popular, wrote: ‘The sight of a feather in a peacock’s tail, whenever I gaze at it, makes me sick!’ So, he admitted that the peacock&8217;s tail posed a problem for his evolution theory. Evolutionists also believe that birds’ feathers evolved from the scales of reptiles, but there is a lot of difference between the leathery scales of a reptile, and the soft, yet tough feathers of a bird. And no fossils have ever been found of reptiles whose scales were changing into feathers. We believe the peacock's tail was not made by chance, but was designed by God to look beautiful, so that we could admire it and praise Him for his handiwork! In the first chapter of the Bible we read all about the creation of the world. God created trees and flowers, flying creatures, sea creatures, insects, and animals that live on the land. Finally, God created human beings, and then, ‘God looked at everything he had made, and it was very good’ (Genesis 1:31). When you paint a picture, or make a model, you get pleasure doing it, and if you make a good job of it, you will feel proud of your work. In the same way, God was pleased with His newly–created world, every part of it lovingly designed and planned. But of all His Creation, God loves human beings most of all. He created us so that we could love Him and know Him. Sadly, ever since the first people, Adam and Eve, disobeyed God, people have been going their own way. All of us have sinned against God in some way, and because of this, we are separated from God. God was pleased with all His creation, but what pleases Him most of all is when we believe in Jesus, His Son!